It was a lovely day yesterday and the cycle-paths of Drenthe were calling so I decided to make the journey to the Dwingelderveld to eat my lunch next to the somewhat famous radio telescope. Why there in particular ? I'm currently reading Harry Mulisch's "De Ontdekking van de Hemel" ("The Discovery of Heaven"). The author stayed in the area of the radio telescope during the time when he wrote the novel and the telescope features in the book as well as in the film adaption of "The Discovery of Heaven". On the way out I stopped at a village bakery to buy some of their delicious, sourdough bread for my lunch. Continuing onward, a reminder of the continuous progress being made. This country road isn't very busy, but it is used by some heavy vehicles and this cycle-path, which I followed for about 6 km before turning in a different direction, is a big improvement. Cycle-paths which provide safe and direct routes make cycling accessible to everyone. "For your and our safety, 60 km/h". A reminder that some places are yet to be improved. Sometimes cycle-paths through woods need bridges over areas of wet land. The most beautiful cycle-path in the province, according to the local paper. I made sandwiches with the bread I bought earlier and read a couple of chapters of the book. A popular spot for hungry cyclists. Europe's radio telescopes are linked to a centre near here, one of the many excellent things funded by the EU. The EU also contributed funds to build some of the cycle-paths along which I rode to arrive here. On the way home, a reminder of what keeps us safe from the danger of large vehicles. 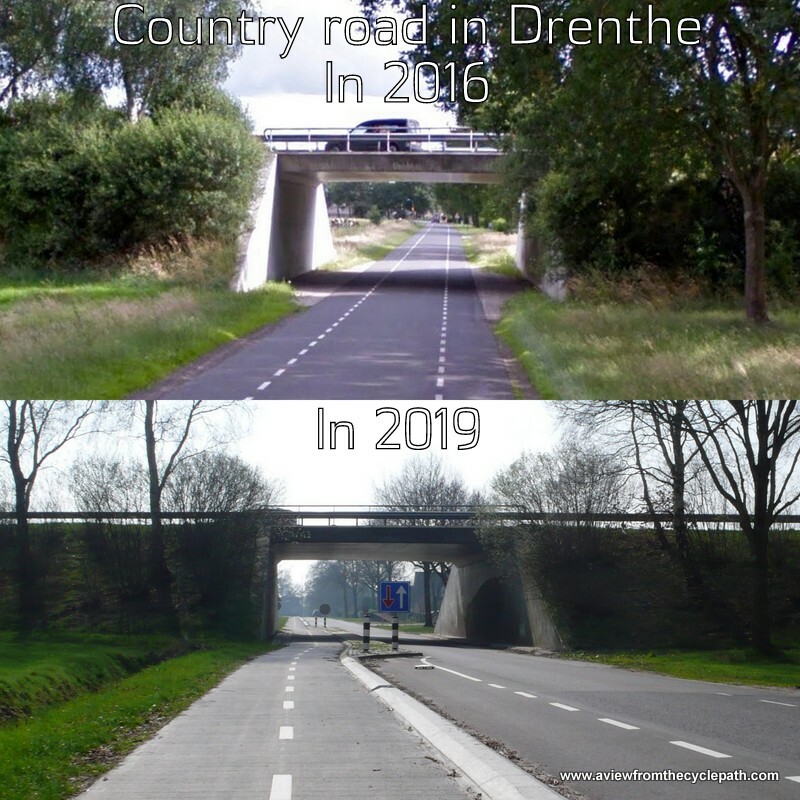 It's not that Dutch drivers are especially skilled or careful, it's not that large vehicles don't exist here (for example, larger trucks are allowed here than in the UK), or that they're not allowed in to the same places as cyclists. We are safe because we rarely interact with those vehicles because both cycle-paths and the road junctions are designed to eliminate conflict and city centres exclude through traffic. Also on the way home, the man in a fluorescent jacket is directing traffic in one direction at a time past the cherry picker. Cyclists were not hindered. Road works need not inconvenience cyclists. I returned home about three hours after I left, having had a good bit of exercise and a very tasty lunch. A very enjoyable extended lunch-break, re-discovering a little bit of heaven here on earth, using nothing more than my muscles and one of the most efficient means of transport to do so. Imagine if sidewalks (pavements in the UK) for pedestrians were unidirectional. If you wanted to visit your neighbour who lived on the right side of your home then you could walk there directly, but to come back home again in a legal manner you'd be expected to cross the road, walk until you were opposite your home and then cross back again. Does that make sense ? Of course not. The inconvenience of expecting people to cross the road simply to walk in the opposite direction is absurd. All sidewalks are therefore bidirectional. Directness of routes is important for cycling to succeed. The more efficient that we can make cycling, the more journeys there are for which people will find it a convenient mode of transport. Bidirectional cycle-paths allow for this convenience. It is, of course, possible to create a poor version of almost anything. That includes bidirectional cycle-paths. 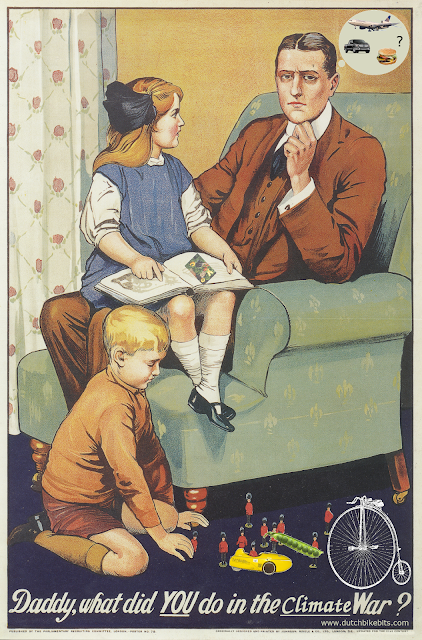 Where they are criticised, look for other issues. 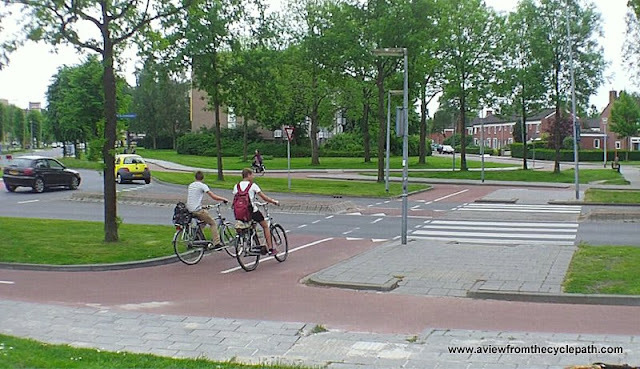 For example, poor junction design which may create conflict or make cyclists less visible to drivers. Cycle-paths through recreational areas are almost always bidirectional. There would be no sense in making them otherwise. This bidirectional cycle-path is alongside a busy road through an industrial area which has four lanes of motor traffic, a central reservation and destinations on both sides. It is not desirable to require people to cross the road than is absolutely necessary. Bidirectional cycling is possible on both sides of the road. This bidirectional cycle-path is in a residential suburb. In this case there is a canal on the other side of the road so it would make no sense at all to require cyclists to cross the road in order to ride next to the canal instead of next to the homes which are destinations for cyclists. Brand new infrastructure linking a residential area to the centre of the city. There is a road behind the bushes on the right, but after the road there is nothing but the railway track. Here also it makes sense for cyclists to ride on one side of the road in both directions. All destinations along this road, including shops and cafes, are on this side of road while on the other side of the road there is a canal. It would make no sense here to make cyclists cross in order to ride towards the camera. On the other side of the canal there is a bidirectional bicycle road which does not offer a through route to drivers. Note also how the road junction design reduces the danger of collision with motor vehicles. The turning radius is small and the black "cannonballs" prevent drivers from cutting the corner. One of several features which defines the safest urban roundabout design for cyclists is a design which allows safe use of bidirectional cycle-paths. These also increase convenience by allowing so few crossings to be made as possible (you are never required to ride across three arms of a roundabout to turn across traffic). Simultaneous Green traffic light junction. Cyclists can go in all directions at once when the lights are green for bikes. All motor vehicles are held behind red lights and all possibility of conflict with them is removed. A very useful design for use with bidirectional cycle-paths. Also note the width of the cycle-path, which can cope with large flows of cyclists. Also see a different traffic light design which feeds into a bidirectional cycle-path without conflict. 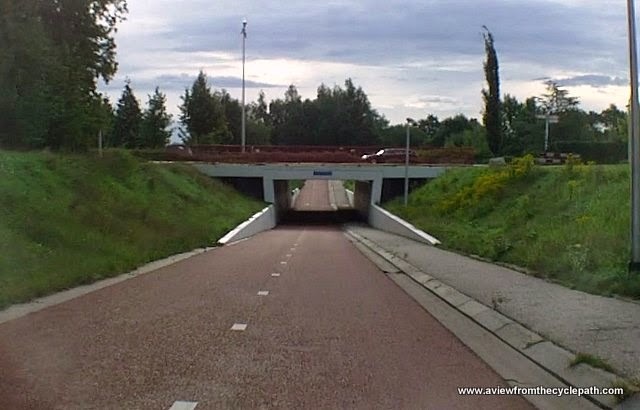 Cycle-paths through tunnels are nearly always bidirectional. 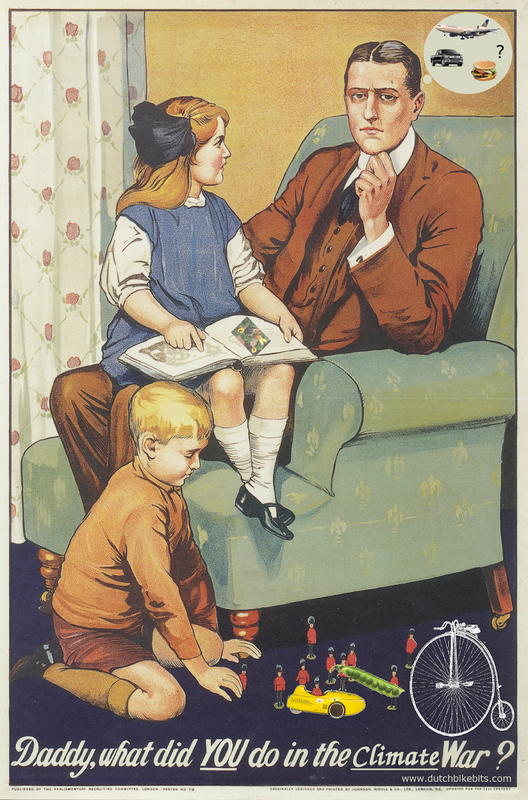 Otherwise we would require two tunnels. Tunnels are generally preferable to bridges for cyclists. This bicycle road is on the other side of the canal from the last photo. Bicycle roads are of course always bidirectional for cyclists, though they are sometimes one-way for drivers. Where a bicycle road ends and cycle traffic is led onto a cycle-path it would be absurd to use anything other than a bidirectional cycle-path such as is shown here. In this case there are some recreational destinations on the right of the road, but the vast majority of destinations (homes and shops) are on the left, and are served well by this cycle-path. Just short of four metres wide, this cycle-path copes well with considerable cycling volumes, especially tidal traffic at school times (the low building behind the cyclists to the right is a secondary school). Behind the camera there is a busy road junction. 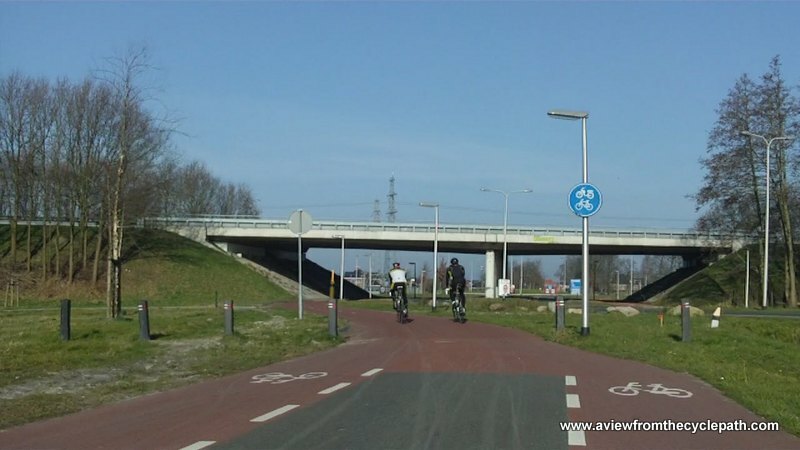 Junctions between cycle-paths require even more width. At this point, the cycle-path exceeds six metres in width. The bridges cross a canal. We sometimes hear blanket criticism of the idea of bidirectional cycle-paths, but it is not justified. In many cases they improve both safety and convenience for cyclists. To a first approximation a bidirectional cycle-path is always more useful than a single-direction path for the simple reason that cyclists can use it in both directions. The work started in 2015 with building of a temporary station, after which the old station was demolished and the new one built. Occasionally it has been chaotic around the station as all the roads were also rebuilt, two new tunnels were made (one for pedestrians, one for cars) and one tunnel was reconstructed (the bike tunnel). The result is really very good. Through motor traffic has been sent underground which makes the entire area more pleasant (apart from buses and taxis) and as a result, the outdated traffic light junction was removed and there are fewer delays for cyclists to cross the road. In particular, cyclists who headed south from the station used to have to stop twice for traffic lights before riding on an on-road cycle-lane along a relatively busy road so it feels as if we are rather spoiled now with the choice of two very high quality bidirectional cycle-paths on both sides of the road which can be reached without any stopping at all. Assen's population is about 68000. There are now 3500 bicycle parking spaces, 2500 of which are in the underground guarded parking while the other one thousands are on the surface near the pedestrian entrance on the eastern side of the station. This isn't the largest cycle park at a Dutch railway station, but Assen also isn't the largest city and this isn't the busiest railway station. 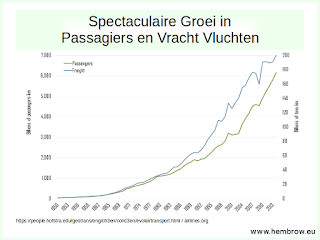 3500 spaces for a population of 68000 means we have better than once space for every twenty people in the city which compares well as a proportion with other Dutch cities. There are now a total of 3500 bicycle parking spaces at the railway station. 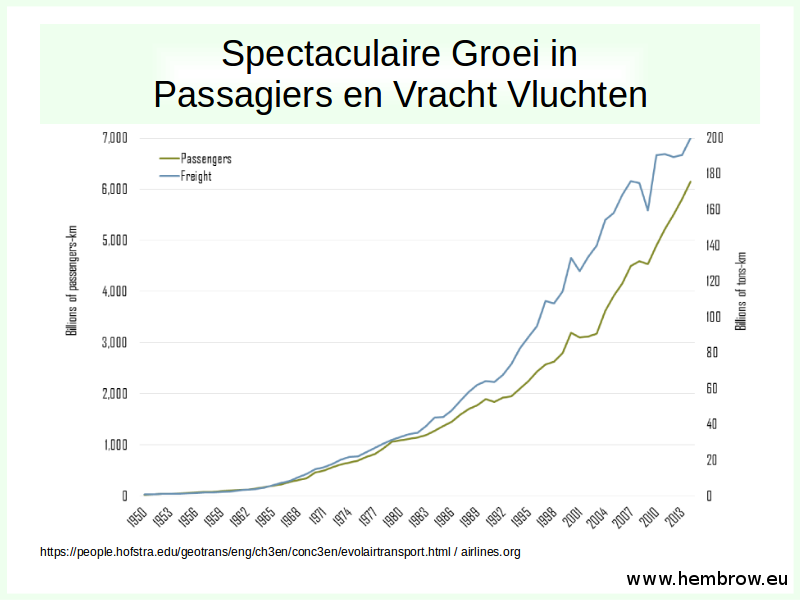 Assen's population is around 68000 so we now have slightly better than one place at the railway station cycle-park for every 20 citizens. In 2009, car parking spaces were removed so that the the outdoor cycle-parking could be doubled in size and it was announced that the total was to be increased to about 2300 spaces. The 2010 upgrade: A building to accommodate 1000 bicycles which seemed quite impressive at the time. This was demolished to make space for the new station. 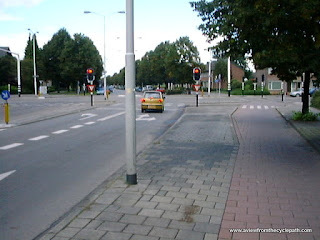 Because the busy road past the station has been buried in a tunnel, the irritating traffic lights which were required to control motor traffic have also been removed (read more about them in a blog post from 2014) so Assen now has one fewer traffic light junction for cyclists. The 1989 station had a blue roof. The traffic lights in front of it were annoying. This was the most awkward traffic light junction for cyclists in Assen, requiring people to make a two-stage left turns. It is best if cyclists don't have to make two-stage turns and that can be avoided with other traffic light designs. Don't take inspiration from older infrastructure like this. This photo of a group from Washington University who came for a Study Tour in 2016 and not quite ready for their photo to be taken, taken outside the temporary bike shop also happens to show the temporary steps and lifts in the background and the orange post box. Everything was provided at the temporary station. What has been built is an impressive new railway station and it has impressive cycling facilities. I'm also impressed with how well the temporary station worked. But what is its purpose ? The sole purpose of these particular bicycles, OV-Fietsen, is to enable and encourage people to make more and longer journeys by means of a polluting motorized mode of transport - the train. The problem with these huge and attractive bicycle parking facilities at railway stations is that the station isn't really a destination. The destination of the people who cycle to the station is tens or hundreds of kilometres away and it is likely that 90% or more of the distance covered by any given passenger will be in a powered vehicle, the train, and not using their own power on a bike. Huge bicycle parks at railway stations serve the same purpose as motorways - they encourage people to make more and longer journeys by polluting means of transport. Bicycles are the most efficient transport mode on earth. It seems rather a shame to limit the scope of that most efficient mode of transport to that of providing a link to a far less efficient transport mode. But that is what we are building. To truly to reduce the impact that we make on this planet we need to stop making journeys that are beyond the distance that we can cover by our own power. 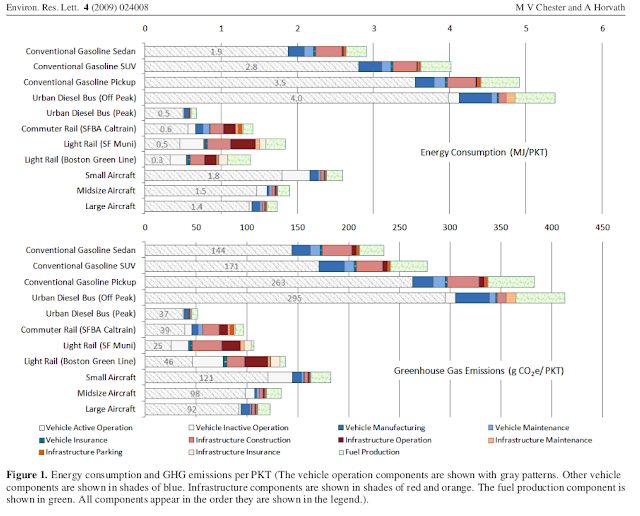 We can't travel ever more and achieve a reduction in energy usage. It requires something other than building lots of infrastructure to support more journeys - it requires redesigning both our cities and our lives so that what we need is close by. 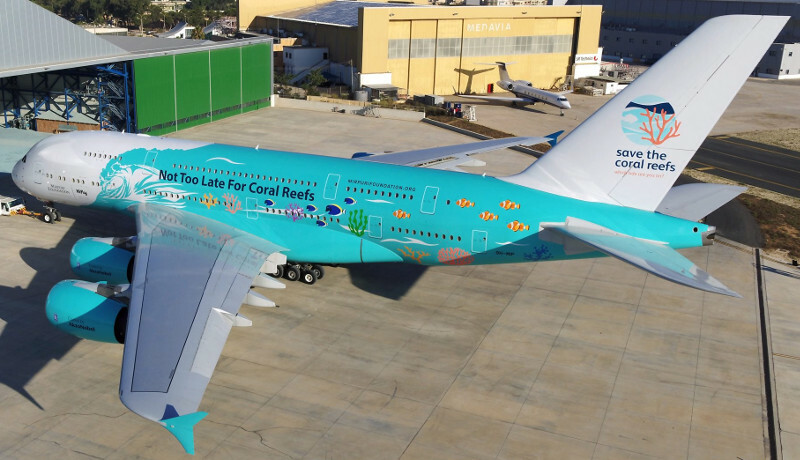 Calling for less flying is a good thing for the environment. 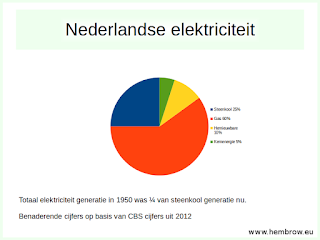 Groenlinks political party in the past, but can't support this. There is a disturbing tendency for people to assume that travelling by train instead of by air or by car is automatically a win for the environment. Unfortunately, there's just not a huge difference in energy consumption per passenger kilometre between different powered transport modes. Making the same or a similar journey by a slightly less polluting mode doesn't make for a non polluting journey. That can only be achieved by making that journey by a genuinely non-polluting mode (walking, cycling, sail-boat) or by not making the journey at all. i.e. by not commuting, by not taking holidays, by not taking that tempting 'weekend break', whether by air, sea or rail. 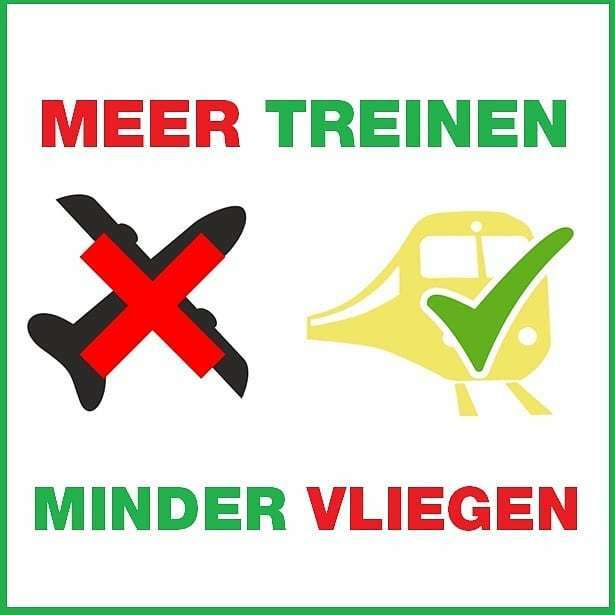 The Dutch railway company makes rather large claims which I think have to be looked at more closely. Claiming to use "100% green electricity" because you've signed up for a green tariff does not mean that all the electricity that you use comes from wind turbines. 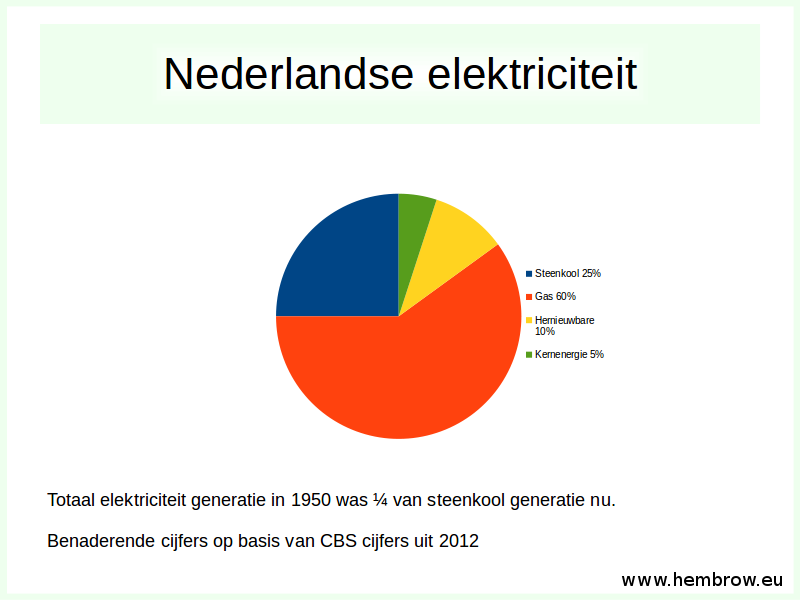 Just like everything else which runs from Dutch electricity, the trains are connected to a grid on which 80% of the electricity is generated by burning fossil fuels. When the wind isn't blowing the trains run on fossil fuels. 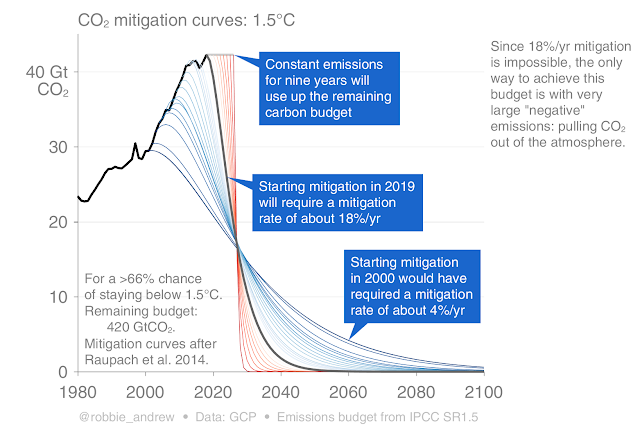 The stated ambition of becoming "carbon neutral" by 2020 is a start but it actually falls a long way short of the already existing claim to use "100% green electricity", which has been made since 2017. 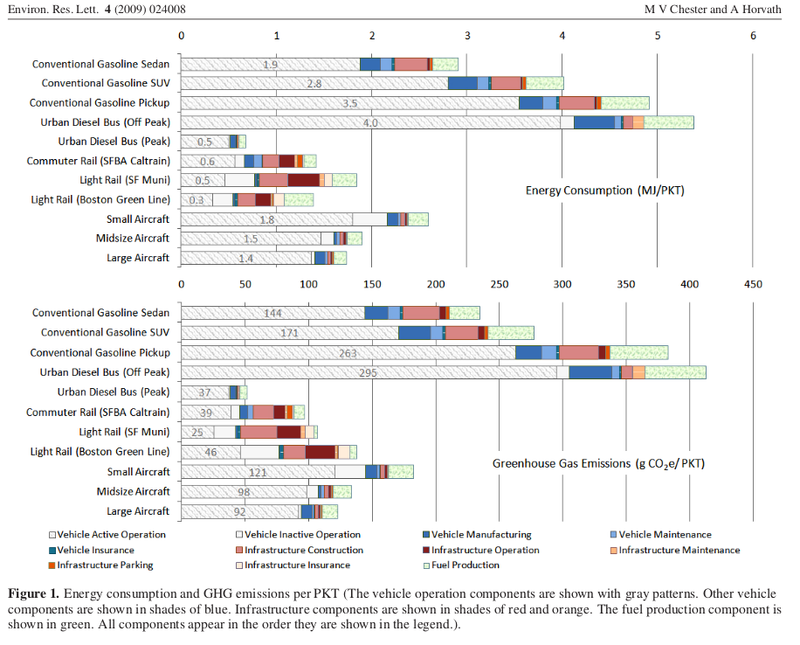 Even if the trains really did have no emissions when running, only around a quarter to a half of the emissions of even diesel powered trains come from the exhaust pipes. The rest comes from other factors including the infrastructure on which they run. This will be a more significant source than average for Dutch railways because the infrastructure has such a short life span. They may be slightly or even quite a lot more efficient than the least efficient modes we can imagine but that's not good enough. 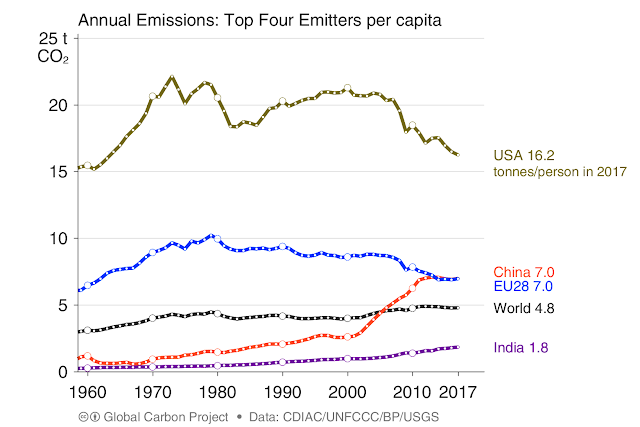 We can't pretend that trains don't have emissions so that we can continue to make journeys. Railway stations in the Netherlands are demolished and rebuilt over remarkably short time-scales. Assen's "old"station lasted only 26 years, from 1989 until 2015, before it was demolished and a complete new station built in its place. was primarily with the local oil and gas company. Even during the 26 years of its existence the old station didn't stand still. For instance, the indoor cycle-park built in 2010 which lasted only five years was itself a substantial structure. The temporary structures had a huge cost as well. Elements of them may be able to be re-used, but requirements won't be the same in other locations, some parts will have been damaged and of course there is transport and construction to account for. Much concrete was poured to build the old station, to build new structures around the old station, to build the temporary station and vastly more has been poured to build the new one. Concrete production and use is one of the major sources of CO2 emissions. Replacing buildings so frequently as we saw here is definitely not a win for the environment.